Cooper Musselman (l) and Tyler McDaniel (r) turn pro for the Barbasol PGA Championship. LEXINGTON, Ky. (July 16, 2018) — Playing as a professional athlete in a much-touted PGA golf tournament only weeks after graduating from collegiate competition is exceedingly rare. Yet, two young-alumni athletes, former members of the University of Kentucky men’s golf team, Tyler “Chip” McDaniel and Cooper Musselman, have achieved that dream. Both will compete in the Barbasol PGA Championship being held July 16-22, at Champions at Keene Trace in Nicholasville, Kentucky. “It is very unusual for young players like Tyler and Cooper to get sponsor’s exemptions into PGA Tour events like the Barbasol,” said UK Head Men’s Golf Coach Brian Craig. “They are getting in by virtue of their accomplishments in high level Division I collegiate golf as well as amateur golf. They are also being shown tremendous support by Brooks Downing, the tournament director, and a huge Big Blue supporter. “Tyler and Cooper have dedicated themselves to being the best they can be at their craft, and I love seeing them get this opportunity to start their professional careers. They both have very bright futures as PGA Tour players, and I cannot wait to watch their careers unfold,” the athletes’ former coach added. The achievement is even sweeter for the young UK alumni because UK HealthCare is one of the tournament's corporate sponsors and official health care provider, and Kentucky Children’s Hospital is one of the beneficiaries of the tournament. Through the partnership, the Barbasol Championship will engage and feature UK HealthCare hospitals and clinics, UK Athletics and the University of Kentucky as a whole. As the Official Health Care Provider for the event, UK HealthCare will provide first-aid services and sports medicine support at the tournament. Kentucky Children’s Hospital is a featured charity of the tournament and the beneficiary of the “Barbasol Championship Acoustic Jam,” a concert at the Lexington Opera House on Tuesday night of tournament week. 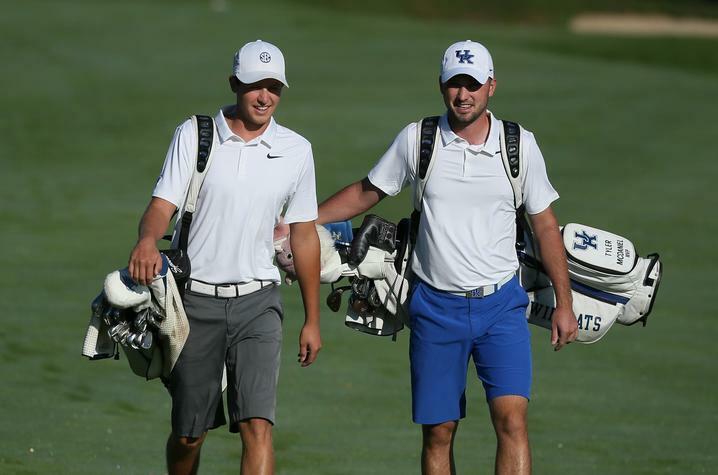 In recent years at UK, golf has shared public accolades and championship headlines with Kentuckians’ beloved basketball, thanks to coaches like Craig and student-athletes like McDaniel and Musselman. Even someone unfamiliar with the sport can recognize that hitting a 330-yard drive, followed by a 118-yard wedge shot that lands a few feet past the cup and miraculously spins backward to plop in the hole for an eagle (a score two strokes less than par) is just as exciting as hitting a last-second, no-iron miracle-shot from half court. The previous scenario is not fiction. As a UK senior, McDaniel is the star of that true tale, and it played out in May at the final round of the NCAA Division I men’s golf regional championship in Bryan, Texas. The eagle won the team the final ticket to the NCAA Championship. McDaniel is most definitely not the only graduating hero on the UK 2018 golf team. McDaniel’s best friend, fellow-senior Musselman, grabbed just as many heroic headlines throughout the season. They were just as outstanding in the classroom. As student-athletes, each regularly appeared on the SEC Academic Honor Rolls. In fact, with a team grade-point average that exceeded a 3.5 for the 2016-17 academic year, the entire team was tabbed an All-Academic Team by the Golf Coaches Association of America. These two young men — both seniors sweating through their final exams a brief two-and-a-half months ago — are primed now to make a huge splash in the world, but their ties to UK are still strong. McDaniel and Musselman still see their UK friends and teammates frequently, and both dread August when it finally sinks in that they have graduated and no longer have classes to attend. Like well-trained, young thoroughbreds in the starting gate for the first time, their approaches differ only by a degree as their professional debut draws near. It has not escaped the attention of McDaniel and Musselman that UK and the Commonwealth are behind them every step of the way. “It’s awesome, not only just the UK hospital, but the support from the UK community and the area is special. I’m excited for sure,” accounting graduate McDaniel said..
PGA Tour events generated more than $180 million for charities in 2017 and have now raised an all-time total of $2.65 billion for charity. The statewide philanthropic effort for all participating nonprofits will receive a 10 percent matching donation from the PGA up to $2 million. Lexus of Lexington will serve as the Presenting Sponsor for the charitable program, which will be managed by the Bluegrass Community Foundation. UK HealthCare includes UK Albert B. Chandler Hospital, Kentucky Children's Hospital and UK Good Samaritan Hospital as well as more than 80 specialized clinics, 140+ outreach programs, and a team of 9,000 physicians, nurses, pharmacists and other health care workers — all dedicated to patient health.